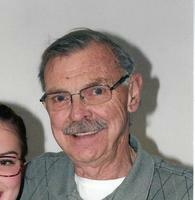 Provide comfort for the family of George Minner with a meaningful gesture of sympathy. George “Gorg” Minner of Olyphant died Sunday January 27, 2019 at the Wilkes-Barre General Hospital shortly after admittance surrounded by his family. George is survived by his wife of 28 years, Mary Ann Devereaux Minner. He is survived by 2 children from a previous marriage; David Minner and wife Sandy, Dickson City, and Kathy Loudin and husband Cliff, Dunmore. He was preceded in death by son George “Georgie” Minner and a brother Ray Minner. Also surviving is a grandson Matthew Minner who he was most proud of receiving the rank of Eagle Scout. George is survived by many nieces and nephews. He especially enjoyed raft rides, hot dog hikes, and beach time with Christine Hanis, Pam Colborn, and Megan Colborn. Most important to his heart were Julianne Dunay and Rhianna Dunay. George served in the United State Marine Corp and often shared that those experiences changed his life. George retired from Chamberlain Manufacturing just in time to babysit his great-great nieces Julianne and Rhianna while their parents worked. After doing that for many years, George returned to work at Simplex Industries for what he called the best job ever. George was an avid golfer and played in many leagues. George enjoyed hunting with his family and there is always a fun story to be told. George is a former Boy Scouts of America Troop Leader #88 in Dunmore. George was a soft spoken, mild mannered, gentle, man. His greatest asset was that he loved unconditionally and never judged. A member of Providence United Presbyterian Church, he was a Deacon at the church. George touched the hearts of many persons, family, and friends. He will be remembered for the fun he had with all. Memories of good times, silly antics, and laughter will always remind us of George. “Gorg, thanks for the fun ride, I had a Blast.” – Love, Mary Ann. Funeral services will be held Wednesday at 11 am in the Providence United Presbyterian Church, 1145 Providence Rd., Scranton. Friends and family may pay their respects Wednesday morning from 10 am until service time. To send flowers in memory of George Albert "Gorg" Minner, please visit our Heartfelt Sympathies Store. Your Comcast Family. sent flowers to the family of George Albert "Gorg" Minner. MaryAnn, very sorry for your loss. So sad. Mary Ann so sorry to hear about your loss. My thoughts and prayers are with you and your family. Thank you for everything you did for the young men of Troop 88, Dunmore, God Bless you and your whole family.